1. Twins!! We got to meet the twins! They are absolutely adorable and perfect. All three kids got to hold them and were just so interested in them - even Bryce. A big thank you to Jesse and Kelly for having us over. I know how much of an adjustment this is especially with Kelly recovering. We cannot wait to love on them some more and to be a part of their lives. 2. Dinner Out! Jason made post-Valentine's Day reservations for us at Ten Ten. It's the same restaurant group that runs/owns Fleet Street Kitchen where we ate for my birthday. It was delicious!! The menu was the perfect variety and both of us really enjoyed our entrees. I had the grilled prawns, pork belly and grits - OMG! It's not as formal as FSK, but the food was just as good. In fact, I'd say the dessert I had (chocolate torte) was one of the best restaurant desserts I've ever had. It was nice just having a quiet evening for the two of us. And then on the way home we drove by the new house just because we can't wait. 3. Grandparent dinner - While we were at Ten Ten, my parents took the kids out for a "fancy" dinner to the Macaroni Grill. They had strict orders to NOT order macaroni & cheese - which they all avoided. Bryce even found that he likes Fettuccine Alfredo. Who knew? Apparently they behaved well and even rewarded my parents with a compliment on their behavior. Thank goodness but I wish they would behave better for my mom at home! 4. Dry Walled! On Sunday morning we met our new sales agent at our house for a quick look at the house now that the dry wall was hung. You can imagine our surprise to find that a crew was there for the second day in a row working on the "mud." The kids stayed in the car watching a DVD while we toured the house. It looked great and I loved seeing the rooms "completed." I know there is still a lot left to do but it's nice to get a real feel for a room now that they have all their walls. One of my favorite shots is this one from our master bedroom. You can see the hallway back to our bathroom - with his/her walk in closets and a linen closet along the way. So exciting to see it walled! Looking into the powder room (left) and kitchen - it's kind of hard to get a real perspective on the kitchen without the cupboards and island. 5. Major Purchases - now that we are likely within 45 days of settlement (hoping to hear this week) it's time to get serious about our major purchases. Aside from blinds (omg, we have a lot of windows), our biggest "must" purchases are our washer/dryer and kitchen table. We love the table and chairs we had in the kitchen in the old house but we've decided now that we have a real dining room that we want to use it in there. Especially since it seats up to 8 and is starting to show some wear and tear from daily use by the kids. So I started looking online and found the exact same set I liked at Gardiner's at Just Cabinets for $100 less! It will be perfect for us in the kitchen for regular family meals. Next it was onto Home Depot because we knew that we could get an HE washer tax free and with an overall 10% discount. 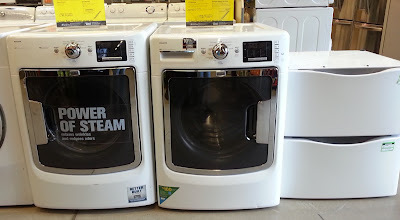 Last week we finally settled on the Maytag Maxima washer and dryer (with pedestals) after reading way too many online reviews and Consumer Reports. They can keep them in stock for 90 days so we'll be fine waiting for our settlement date. They had them in pretty colors but it wasn't worth the extra $100/each so I am fine with white. The washer even has a fan in it to keep it from smelling bad like our old front loader did if you closed the door between washing. Fancy! On our way home, we stopped at my brother's because he agreed to store our table and chairs until move in since our storage units and my parents are tapped out on space. When we got back to my mom's we joked that we spent all that money and all we had to show for it were some expensive pieces of paper. 6. Dinner with my Kevin & Kelly - finally, to end our weekend Kevin and Kelly came over for dinner. The kids just love them so much and we hadn't seen them in a while so it was nice way to spend the evening, especially since we didn't have to go home and could sit and talk to them after the kids went to bed. I wish I was off work today too but at least I earn a day off. Better to save them for when we are in the house and I have so much to do that I'm overwhelmed! Such lovely pics of the babies. They are so sweet & tiny! Makes HL look ginormous! Congrats again. The house is really coming a long! I can really see it now. Very exciting!